Adult Living Skills (ALS) focuses on life skills training for adults who are blind or visually impaired with developmental disabilities. Program participants attend daily activities designed to develop self-sufficiency, increase independence and help them actively participate in today’s society. An individual service plan is developed for each participant to outline short-term and long-term goals. In the studio apartment constructed on-site, participants are trained in skills to increase their independence, such as dish-washing, dusting, sweeping, cleaning and basic cooking. Participants also operate a coffee sale and aluminum can recycling program to develop working skills and responsibility. Participants receive hands-on training in spatial awareness, detection of auditory cues from the environment and independent travel inside the facility. Participants practice simple assembly tasks, such as folding, stuffing, sorting and collating. As pre-vocational skills are mastered, participants become eligible for other vocational training programs at The Chicago Lighthouse or elsewhere. Participants learn to read and write in Braille and large print, communicate, perform basic math, use a telephone and manage money. 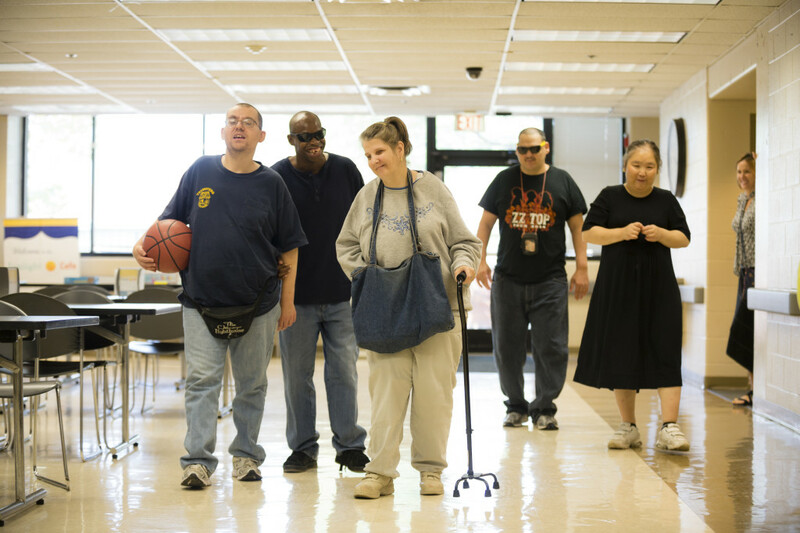 Participants gain social skills through community outings, which include recreation and eating in restaurants, and travel to a neighboring facility for exercise twice a week.